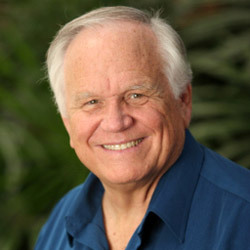 Loren Cunningham "The Book That Transforms Nations"
Loren Cunningham is the Founder of Youth With A Mission (YWAM), an ever-expanding global “family of ministries” born in 1960 which has reached into every nation. The work of YWAM encompasses evangelism, training and mercy ministries and is manned by nearly 20,000 full-time staff plus 25,000 students from more than 200 nationalities and a wide variety of denominations who serve at more than 1,300 YWAM locations in 180+ nations and dependent countries. More than four million students, short-term volunteers and staff have been a part of YWAM since its inception. Loren has personally gone to every sovereign nation on earth, all dependent countries, and more than 100 territories and islands, for the sake of the Gospel. This has given him valuable insights into global trends and uniquely prepares him to share God’s strategies for world evangelism. And that is exactly what this message is all about. Loren Cunningham shares his vision of a world-wide wave of evangelism. This is the first 13 minutes of his latest message "The Book That Transforms Nations".